Sometimes I think I have missed my calling as a puppeteer because I could swear that longsuffering second sock is trying to say something smug in this shot. I mean, here I am, a person who could pass for a grownup most of the time - in small doses, at least - with a rather large collection of stuffed animals. Betty White has a room for her teddy bears according to one of her books, and she freely admits she visits that room regularly, but mine dance around and play and fold socks for me and things. They have personality. 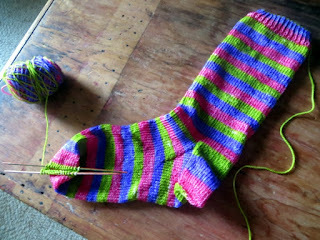 Well I will graft shut the toe of that sock eventually. Then it shouldn't look like it wants to talk... until one day when I'm folding them back right side out after a wash and have it briefly on my hand sock-puppet style. Meanwhile: sock done! And now I am on to moving the furniture again and trying to clear away a few more boxes. Everything goes on hold at home during cottage season, and in spite of this week's heat wave I know I will have to be in a position to dig out the fall things soon. Hope you have a pleasant day planned and I'll see you tomorrow!